Legendary New York Mets Announcer Gary Cohen Previews Upcoming Season with Mets Fans at Ridgefield Library on Saturday, January 26 from 2 to 3:30 pm (seating begins at 1pm). Tickets available on Monday, December 10 by clicking here. 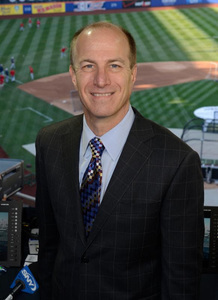 Award-winning New York Mets play-by-play announcer Gary Cohen returns to the Ridgefield Library on January 26 for the Library's 2019 installment of its popular Hot Stove League program. Gary will entertain questions from the audience, share anecdotes from his 30 years broadcasting the Mets and provide his take on the upcoming Major League Baseball season. He was recently inducted into the New York State Baseball Hall of Fame alongside his broadcasting partner and former Mets player Keith Hernandez. The Hot Stove League event sold out quickly when Gary last appeared at the Library during the 2017 off-season. Donation: Adults -- $30 Children -- $15. Attendance is limited to the first 200 people. All proceeds will benefit the Annual Operating Fund of the Ridgefield Library. Raffle drawings for New York Mets memorabilia, including an official MLB baseball signed by SNY's broadcasting team of Gary Cohen, Keith Hernandez and Ron Darling (courtesy of SNY), and official MLB baseballs signed by current and former Mets heroes, including Mookie Wilson, John Franco, Amed Rosario and Steven Matz (courtesy of the New York Mets). Raffle ticket packages will begin at $5 and will be available on January 26th at the Library. Winners will be announced at the end of the Hot Stove program. Click here to purchase tickets or visit the Ridgefield Library (beginning Monday, December 10). Attendance is limited to the first 200 people. the Ridgefield Library (beginning Monday, December 10).